Hello. I saw your listing on Moveandstay for Regus - Singapore, Ngee Ann Centre: from 25 April 2019 to 26 April 2019 I like to learn more. 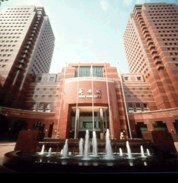 Ngee Ann City is a landmark building complexring the most sought after office address by both multinational and local companies and sits right in the middle of the famous Orchard Road belt of shopping centres, major hotels, offices and amenities. You`ll be operating alongside Fortune 55 companies with an image that even multinational companies would envy. Orchard MRT Station can be accessed directly from the basement of the building.